A modestly sized but carefully crafted addition, this project breaks free from the small, compartmentalized spaces typical of the original 1950s brick ranch floor plan. 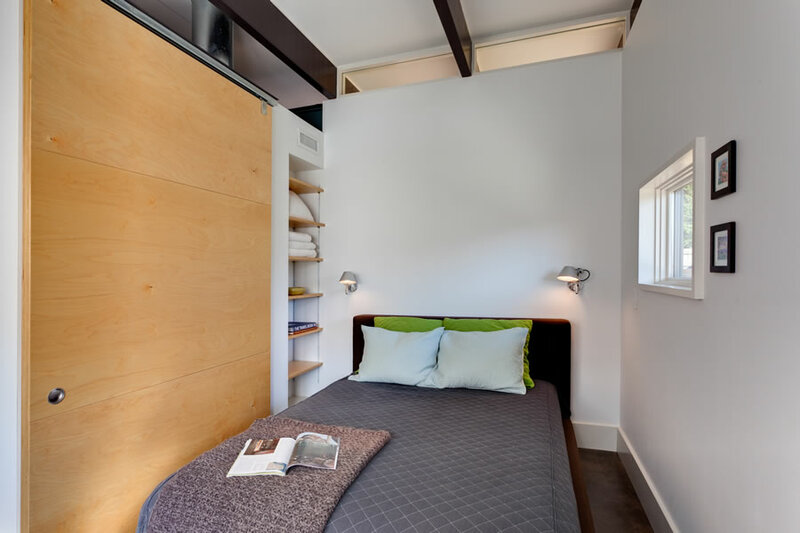 The new 850 sf addition accommodates side entry, a small office niche, a living area and a guest room. The addition is intentionally two sided - presenting a relatively solid veil towards a well-traveled street and oncoming car lights while revealing a more delicate, furniture-like quality with a glass curtain wall between the primary living area and the family’s private yard and treasured old maple tree. The room is heated with radiant heat in the exposed concrete floor and supplemented by a wood burning fireplace that separates guest from living quarters. The addition is sided in a cypress rain screen and flat-locked copper panels. An exterior porch at the end will be screened by bamboo plantings in a cast-in-place planter that is integral with the foundation. A thin, light roof plane floats over a hybrid structure of laminated wood beams and a steel girder, allowing light to flood in through clerestory windows and bounce off the ceiling.